Publisher(s): Sega of America, Inc. Description: Two games on one cartridge. Light Phaser used for Safari Hunt. Box Text: HANG ON is the 3D motorcycle race game that's taken the arcades by storm. Race through grasslands, seasides, valleys, nighttime city scapes and, of course, motorcycle racecourses. This game is so fast it even gives you special racing techniques like Hang On and Countersteering for taking the corners. 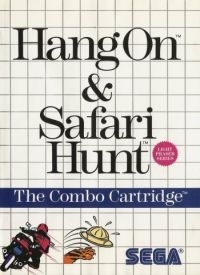 SAFARI HUNT is the most complete jungle game ever created. Scramble through thick forests. Jump over gulping bogs. And watch out for the alligators. Because they're watching out for you. 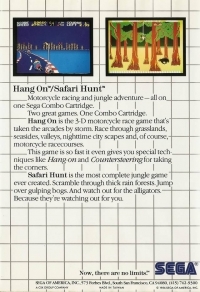 This is a list of VGCollect users who have Hang On & Safari Hunt in their Collection. This is a list of VGCollect users who have Hang On & Safari Hunt in their Sell List. This is a list of VGCollect users who have Hang On & Safari Hunt in their Wish List.